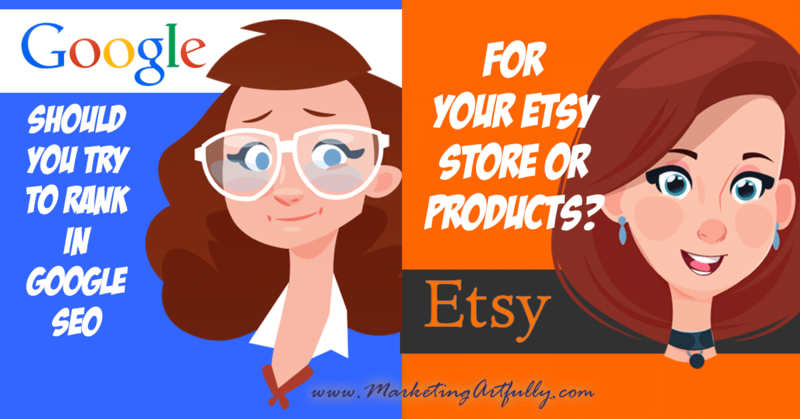 You are here: Home / Etsy Marketing / Should You Try To Rank In Google SEO For Your Etsy Store or Products? My Etsy peeps have been asking about how to get their Etsy products ranked in Google SEO search. This post breaks down ranking factors, things we can to increase our views and key ideas and tips to try today! Etsy SEO and Google SEO vary in pretty key ways so knowing what matters will help you stop wasting time on things that don’t matter! What Do I Know About Google SEO and Etsy SEO? I have been doing Google SEO since the dawn of time, okay for over 10 years and teach classes locally and online about Etsy SEO. I am pretty “in the know” and keep up regularly on best practices for both sites, updating my information when there are big changes. My website ranks well for keywords in Google and my Etsy products rank in Etsy search. What Are Google Search Ranking Factors? Let’s get started right from the beginning. Google uses many different ranking factors for including an item in their web results. Here are a few that they have disclosed (there are many ranking factors in their algorithm that they do not disclose). Keyword In Domain Name – It looks like we have this because the URL dynamically adds words of the Title you use, but it is not true… the actual address of your listing ends at the numbers (ex. https://www.etsy.com/listing/467068929/). This is why we can change the Titles of our listings without messing anything up! As we can see here, Etsy is pulling the first 53 characters of our Title. Keyword In Description Tag – This used to count a lot more in Google search results, but now the main function of this to be your “salesman” on the SERP (search engine results page). Etsy shows the first 276 characters of our description as the description tag. Image Optimization – This means naming your photos with the title of your post… for example my image name for this post would be google-seo-etsy-store.jpg. That would help Google realize that this is what my post is about. This has nothing to do with Etsy SEO. Etsy renames all of our pictures with a gibberish combination of letters and numbers. Keywords In H1, H2, H3 Tags – Because Etsy doesn’t allow HTML in our listings we can’t use heading tags. Keyword Word Order – Matters to Google AND Etsy SEO. Exact matching a search will lead to a higher ranking in both. For example, if someone is searching for “red wool scarf”, products matching that exact order will rank better than if they have “wool scarf red” in their title. Outbound Links – We can not make these in our listings so ignore. They are links to related content that would match our product. Internal Links – There seems to be some value to linking your pages together internally. For example, you link to your category page, about us or home page from your listings (Etsy does make links to it’s own site “live”). Please remember that each page only has to much “Google Juice” so if you link to 1 page your are giving good value, if you are linking to 50 pages you are splitting your Google Juice into very small, unimportant amounts. Grammar & Spelling – Matter! Shoot for a 5th grade reading level and spellcheck! 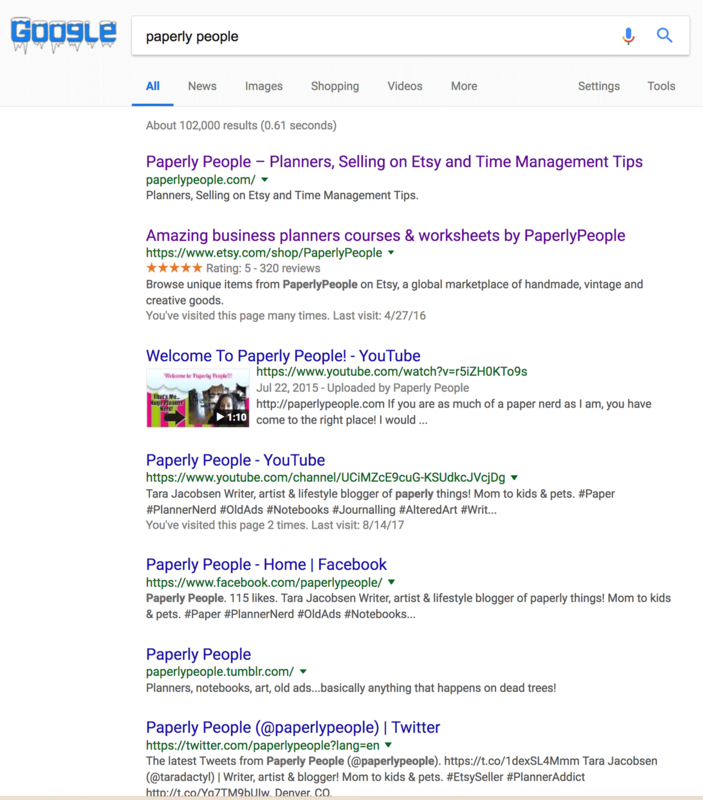 Page Category – This is one of Google’s ranking factors so if you are not using Categories in your shop yet, get them set up now. There are literally hundreds of other things that factor into the rank your listing or store page gets, I just wanted to cover the main ones I see the most confusion about! Now let’s talk about showing up in Google search as an Ecommerce product listing page. 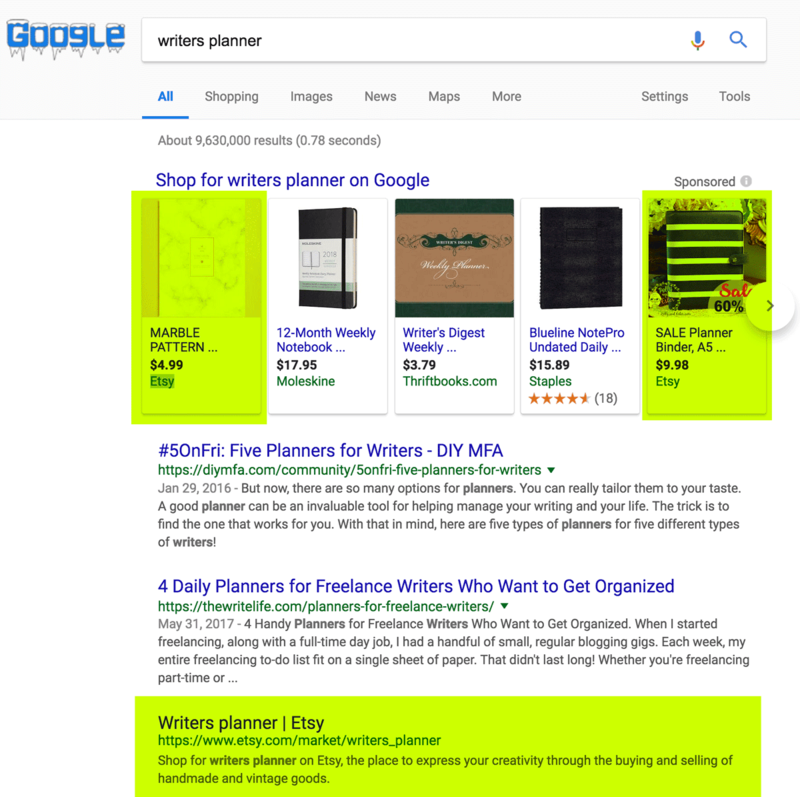 Here are the search results for “writers planner”. The first thing that jumps out is that there are 9,630,000 results. This is a bit more than Etsy sellers are used to, but not crazy in the grand scheme of things. There are three early results for Etsy. Two shopping results in the sponsored section and then the global Etsy search result for Writers Planner. This leads me to believe that either Etsy or individual sellers are paying to promote these products and since we are talking about organic Etsy Google SEO today, we are going to skip those paid ads. Okay, I have some GREAT news for Etsy sellers! Etsy is really good at getting their search results page into Google SERPs! That first listing is mine! Yay, it is a paid listing promotion through Etsy. Those two in the middle are “best sellers” – that is new… hmm wonder if it only shows up when it is a passthrough from Google search, who the hell knows! My “real” Etsy listing for the writer’s planner is #15. There is one thought that you could name your Etsy store the same as your main search result, but as we have already seen, Google ranks listings not shops for product names. Later on down we see YouTube, YouTube (Google owns YouTube), Facebook, Tumbler, Twitter, Pinterest, etc. Honestly, it doesn’t take much to rank for your store name, and there are very few things that you can do other than make sure you link to your store from your social media. Your store description doesn’t even show up, just the generic Etsy description so this is a pretty non starter in my book. What SHOULD You Do For Google and Etsy SEO Efforts? Here are 5 things that I think you could do to rank in Google for your products! Practical, reasonable tips that are doable for any Etsy seller with a wee bit of technical skills. I have split some of these into Vintage/OOAK and then handmade sellers because what you sell matters A LOT! EVERYONE – 1. 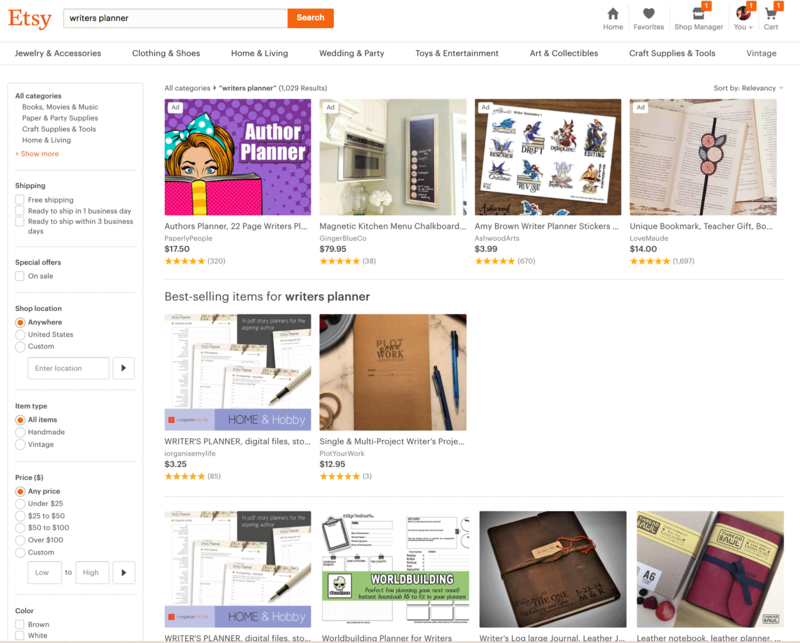 Rank Highly In Etsy Search – I know, you think this one is a cop out, but you can see that the thing that comes up in Google is the search results page for your keyword. There is nothing that will be more effective than spending your time ranking highly in Etsy search. EVERYONE – 2. Get Google Rankings For Other Properties – We can get really focused on Etsy and not realize that there are so many other ways to get ranked on Google than straight to our stores or listings. For example, say we were looking for “anthropomorphic stickers” those are animals dressed up like people. One of my favorite sellers, Gianna from Pergamo Paper Goods, sells these! Getting that phrase ranked in Google will be easy peasy since she competing with mostly ecommerce pages. We get so caught up in Etsy SEO, do you think more people are searching on Etsy for stickers or on Google for stickers! HANDMADE 3. 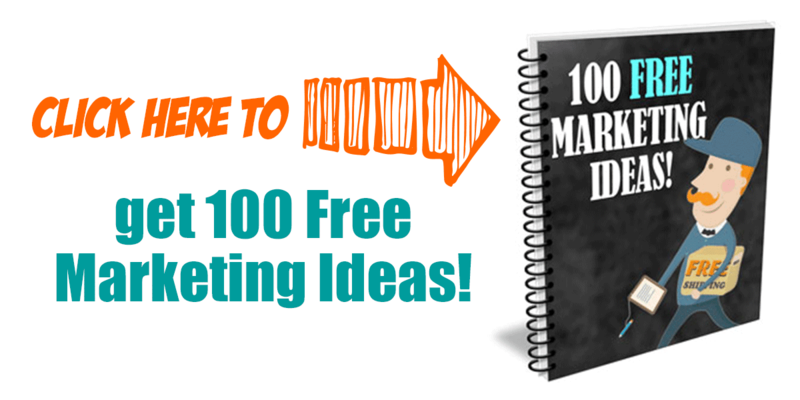 Inbound Links – This is less of a Google thing and more of a marketing thing. If you are a handmade seller and have products that you sell consistently, it makes sense to build links to them. Put them on Pinterest, try and get Buzzfeed links, send free products to bloggers and influencers. Whatever it takes to get stable, steady links to those products is what your main focus should be. VINTAGE/OOAK 4. Focus On Your Category Pages – Instead of trying to rank each listing separately try to get your category pages noticed. Here are some things to do! I am really big on moving one level up because if you sell your “cow doorstop” eventually Etsy shows them a selection of all the current doorstops instead of sending them to your other shop listings. Not good! VINTAGE/OOAK 5. Renew Old Listings When You Can – Say you think I am crazy and damn it, you ARE going to try and rank your individual listing pages, then PLEASE don’t make a new listing for every product. Make & publish a listing and then when that one sells, renew it with new pictures and description selling a similar item. That way you can have the benefit that the handmade sellers get from having long ranking listings! Well hopefully this helps at least a little. 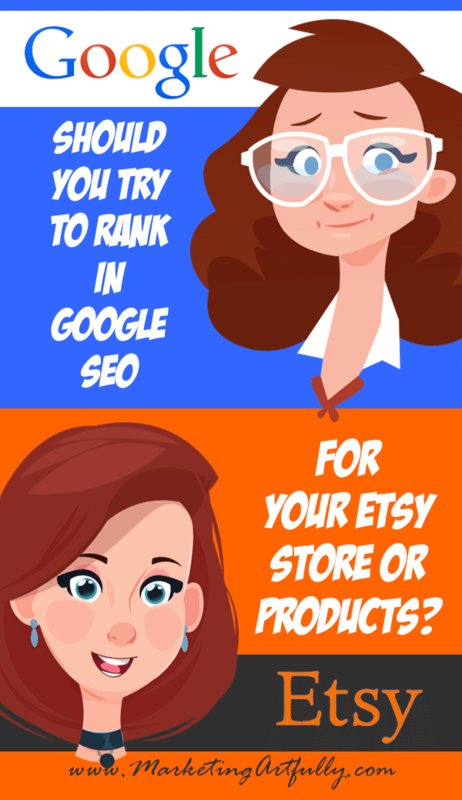 I know it is super tempting to hope that we can accomplish numerous things with our SEO effort, but frankly I find the best Google SEO for Etsy sellers who don’t wan to have their own website is to do great Etsy SEO! There are many things that help with “real” Google SEO that are just not available to us on the Etsy platform and there is no sense fretting about it, just do what you can (have great titles and Etsy SEO) and list more!